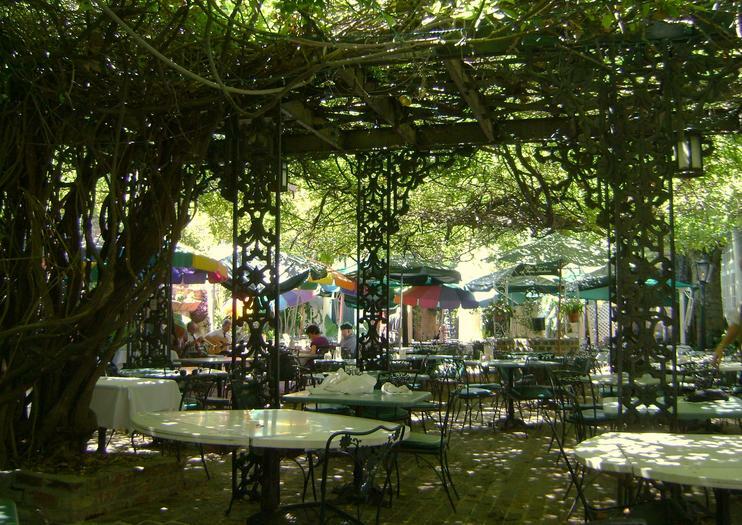 A romantic courtyard restaurant that’s a stalwart in the New Orleans dining scene, the Court of Two Sisters is named after Emma and Bertha Camors who once ran a shop here on Royal Street in the French Quarter. The place is famous for its daily jazz brunch. The building at 613 Royal Street had an interesting past before it was converted to a restaurant in the 1920s. Its first-ever resident was Etienne de Perier, a governor of Louisiana, then a colony of France. In the late 1880s, Emma and Bertha Camors opened what they called a “notions” shop known as “The Shop of the Two Sisters,” selling French perfumes, dresses, and other fine trinkets imported from Paris. After the space was turned into a restaurant, actor Gary Cooper owned it for some years during and after World War II and it was a popular destination for servicemen and women stationed in New Orleans. The Fein family has been running the restaurant since the 1960s. It continues to attract visitors who come to enjoy the generous brunch buffet along with traditional creole favorites, such as jambalaya. It’s a good idea to book in advance if you plan to visit for brunch or dinner. The dress code is casual—jackets and ties are not required. Make sure you try a slice of king cake, a New Orleans speciality. The Court of Two Sisters is located at 613 Royal Street in the French Quarter, between Toulouse and St. Peter streets. It is walking distance from most major points in Downtown New Orleans, and the Canal and St. Charles streetcar stop is a short walk away. Jazz brunch is served every day from 9am–3pm. Dinner is served from 5:30pm–10pm. The restaurant is closed on Christmas Day. Reservations are recommended. Started by Allan and Sandra Jaffe in the 1960s as a place to hold nightly live music sessions, Preservation Hall is dedicated to preserving traditional New Orleans jazz music. Over the years, it has hosted legendary musicians, including George Lewis and Punch Miller as well as modern-day performers like Harry Connick Jr. and Wendell Brunious.